This is by far the busiest time of the year for the team with a race meeting every other weekend. Needless to say the MR Team did a great job getting everything ready including the 2 Carrera Cup Porsches, ‘Bruce’ the McLaren (who was recovering from injuries suffered at Sydney Motorsport Park just a few weeks earlier), the Ginetta GT3 (which also had some extra repairs) and the Fastway Couriers Porsche GT3 Cup. As is customary Warren Luff was on hand as Driver Coach to get the most out of everyone and share his experience of the challenging street circuit in between his duties as Co-Driver for Garth Tander in the #2 HRT V8 Supercar. 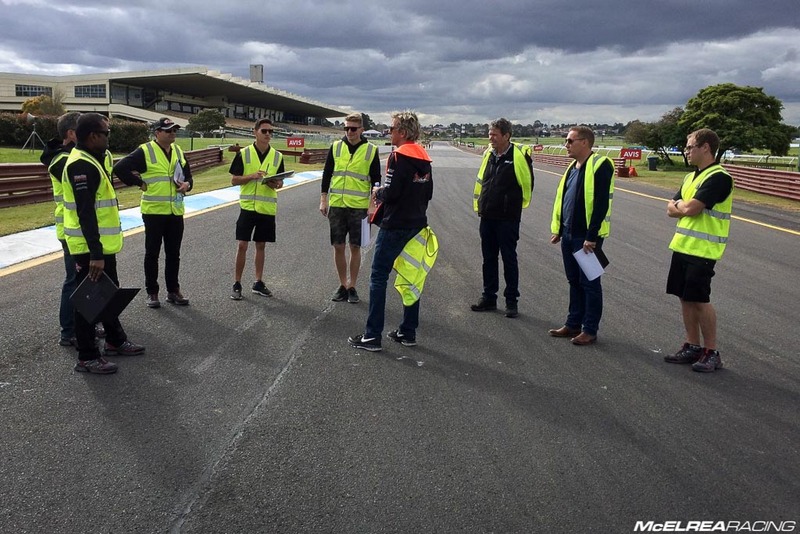 Luffy gave the MR Drivers some pointers on our routine track walk. Fortunately the clouds didn't bring any rain! In the opening race he got a great start and led Foster for 8 laps until a small mistake at turn 4 let him by. He stayed on Fosters exhaust for the reminder of the race, never more than half a second off his rear bumper. On the last lap Matt made a very energetic lunge on Foster and although he made it past, his steering was damaged and he finished second. In races 2 and 3 he made good starts and chased Foster hard for both races. 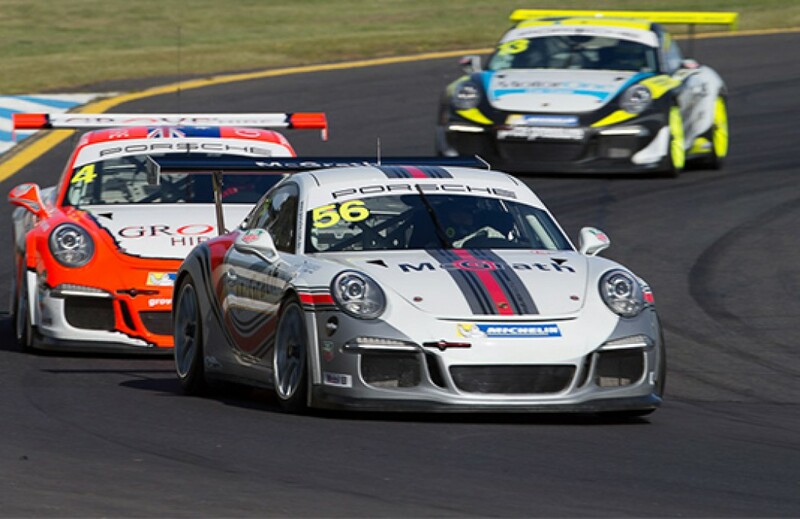 The intensity, mutual respect and pace from both of these young drivers has lifted the bar in Australian Porsche Carrera Cup. Campbell and Foster were within a few tenths of each other all weekend! Shane qualified second in the Tag Heuer Challenge Class, just ahead of Championship nemesis Steven Grove. In race 1 he did a great job to finish second ahead of Burgmuller and Grove. In the second race he had a rough first lap which allowed Grove to get ahead. He tried every trick in his book but wasn’t able to get-by and finished a gallant third. In the third race he had a brilliant opening lap to get ahead of Grove and tag onto the back of Tony Bates. He hounded Bates for the whole race but keeping the Championship battle with Grove in focus, was happy to finish second behind Bates. This was Shane’s 5th podium finish on-the-trot and he now leads the Championship by 29 points. Wallsy qualified a disappointed 17th in Champ Class. He had an uneventful but productive race 1. We pitted him early in the pitstop window to avoid the usual congestion in pit-lane during the newly shortened Compulsory Pitstop Time (CPS). After a smooth pitstop he went out and did his best lap time 4 laps from the end of the race. In race 2 we thought Wallsy did a great job to finish 10th, but his ultra-competitive character still wasn’t satisfied with the result. We are working with the factory McLaren GT team to find some more pace out of ‘Bruce’ as the GT parity rules certainly don’t favour this awesome car. After a disappointing qualifying time Wallsy improved to record his fastest time in the final laps of race 2 and finish in the top 10. 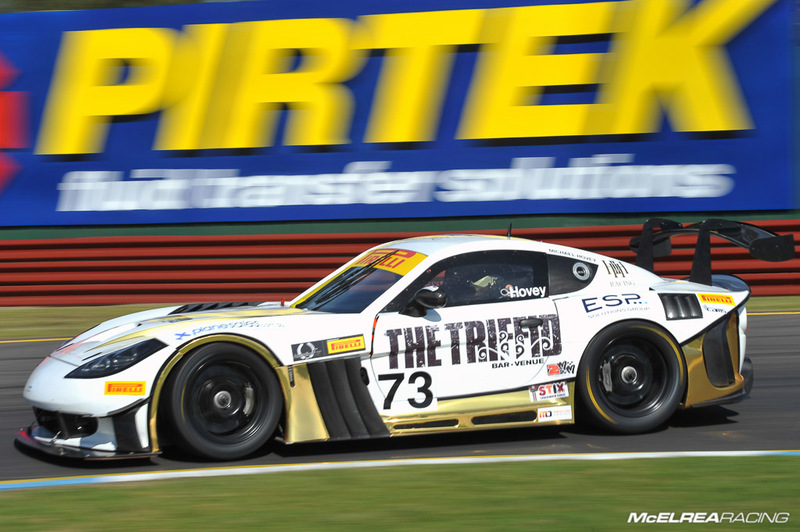 Simon was joined by McElrea Racing team-mate and fellow GT3 Cup Challenge competitor Jaxon Evans for this round. They qualified an outstanding combined third in class. 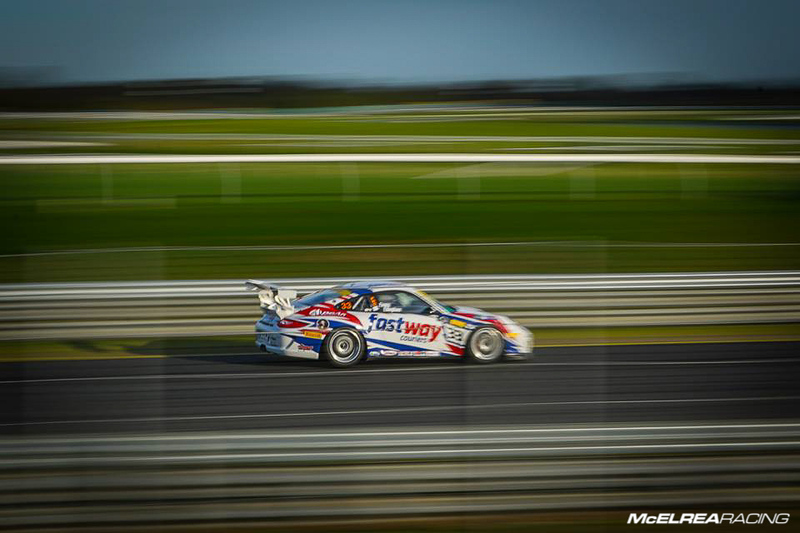 Simon started race 1 and produced a great drive to stay close to the faster Trophy Class cars. He pitted at the 32 minute mark to hand over to Jaxon who also did a great job adapting to the vastly different car speeds in the Australian GT category. Due to a great stint and a couple of mistakes from our competitors, the duo finished in an outstanding 2nd place. 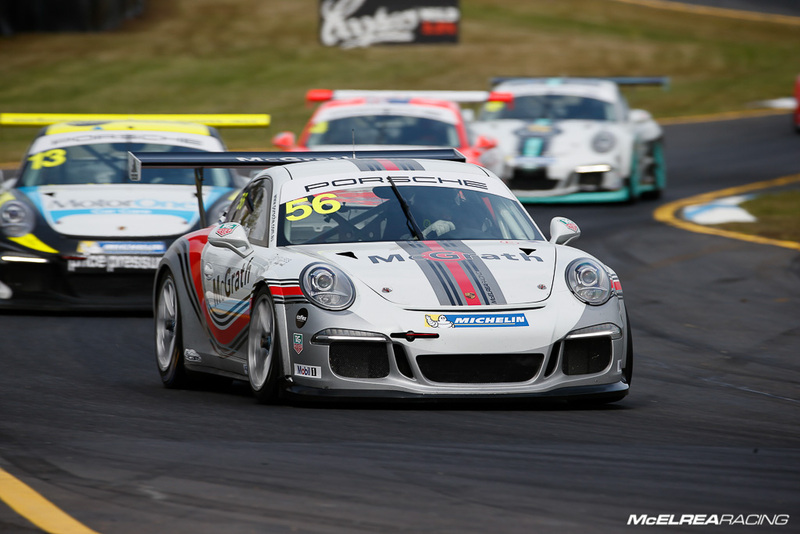 In the second race Jaxon started and did a very strong stint to bring the Fastway Porsche in for the driver change at 33 minutes in first place in Trophy class. Simon drove one of his best races with MR to finish 3rd for the round and to finish his first podium finish for Fastway Racing against much faster cars in the AGT Trophy class. 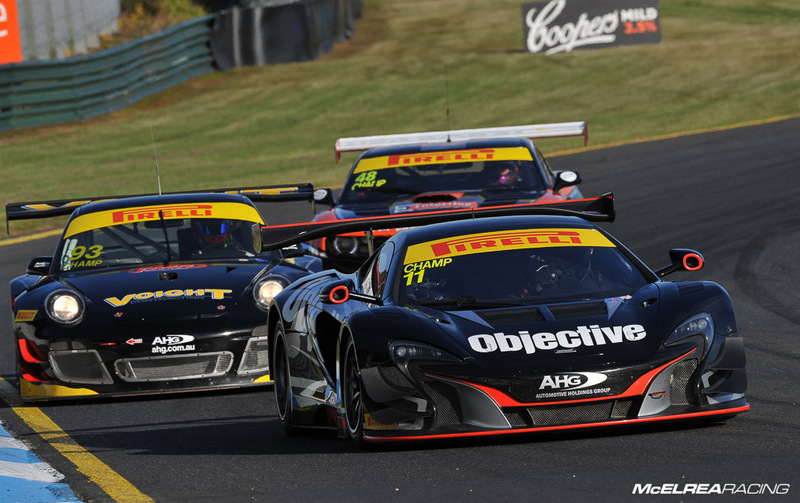 Simon and Jaxon put in a ripper effort to finish second in Class for the weekend! 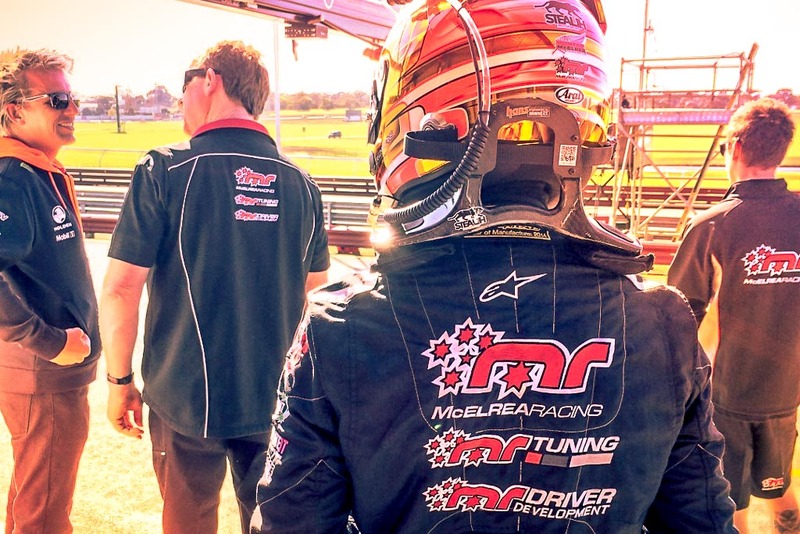 After a couple of tough rounds for Hoves, he decided to leave protégé Matty Campbell in his Carrera Cup car for the weekend and go it alone in the Ginetta, to catch up on some seat time after a quiet Sydney Motorsport Park. In race 1 we pitted him late in the CPS window to take advantage of a potential safety car period, which didn't eventuate. Unlike Wallsy, he had a pretty eventful race and did a great job to stay out of trouble as plenty of his competitors made mistakes and left the circuit particularly late in the race. He was rewarded with 14th outright. In race 2 Hoves had a less exciting race but was able to get plenty of seat time. Unfortunately he was hampered by gearbox down-shift issues but pressed on to finish 15th in the Champ Class. Michael Hovey got some much desired seat time in the Triffid Ginetta GT3 amid some down-shift issues. It is so rewarding for the awesome MR crew that all the effort behind the scenes translates to another race weekend with outstanding results for our drivers. 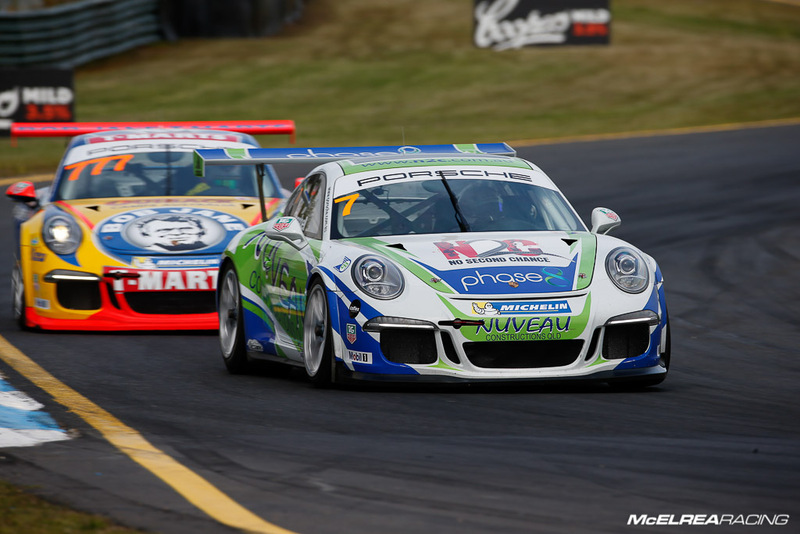 Second place trophies for Simon Ellingham and co-driver Jaxon Evans in AGT Trophy class, Shane Smollen in Tag Heuer Challenge class and Matt Campbell in Carrera Cup Pro Class was outstanding. Hoves In his awesome Ginetta and Wallsy in the stunning McLaren didn’t get the results they deserved mainly due to the number of Pro drivers in the 2015 AGT Championship. The MR team have a very short turnaround and will be back in Victoria next weekend racing in GT3 Cup Challenge at Phillip Island. If you can’t make it be sure to follow us on Facebook for regular updates or we will see you there!